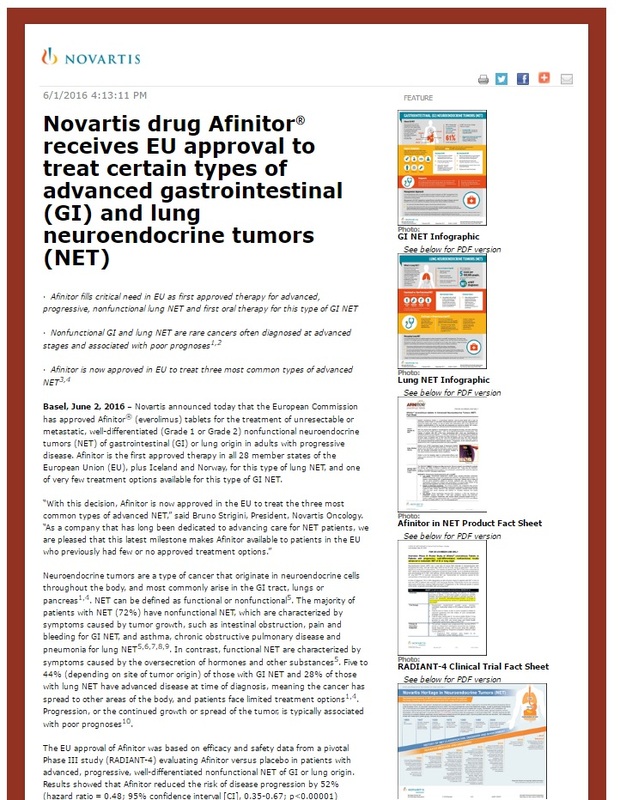 Basel, June 2, 2016 - Novartis announced today that the European Commission has approved Afinitor® (everolimus) tablets for the treatment of unresectable or metastatic, well-differentiated (Grade 1 or Grade 2) nonfunctional neuroendocrine tumors (NET) of gastrointestinal (GI) or lung origin in adults with progressive disease. Afinitor is the first approved therapy in all 28 member states of the European Union (EU), plus Iceland and Norway, for this type of lung NET, and one of very few treatment options available for this type of GI NET. "With this decision, Afinitor is now approved in the EU to treat the three most common types of advanced NET," said Bruno Strigini, President, Novartis Oncology. "As a company that has long been dedicated to advancing care for NET patients, we are pleased that this latest milestone makes Afinitor available to patients in the EU who previously had few or no approved treatment options." Neuroendocrine tumors are a type of cancer that originate in neuroendocrine cells throughout the body, and most commonly arise in the GI tract, lungs or pancreas,. NET can be defined as functional or nonfunctional. The majority of patients with NET (72%) have nonfunctional NET, which are characterized by symptoms caused by tumor growth, such as intestinal obstruction, pain and bleeding for GI NET, and asthma, chronic obstructive pulmonary disease and pneumonia for lung NET,,,,. In contrast, functional NET are characterized by symptoms caused by the oversecretion of hormones and other substances. Five to 44% (depending on site of tumor origin) of those with GI NET and 28% of those with lung NET have advanced disease at time of diagnosis, meaning the cancer has spread to other areas of the body, and patients face limited treatment options,. Progression, or the continued growth or spread of the tumor, is typically associated with poor prognoses. The EU approval of Afinitor was based on efficacy and safety data from a pivotal Phase III study (RADIANT-4) evaluating Afinitor versus placebo in patients with advanced, progressive, well-differentiated nonfunctional NET of GI or lung origin. Results showed that Afinitor reduced the risk of disease progression by 52% (hazard ratio = 0.48; 95% confidence interval [CI], 0.35-0.67; p<0.00001) compared to placebo. The data also showed Afinitor increased median progression-free survival (PFS) by 7.1 months: median PFS by central review was 11.0 months (95% CI, 9.2-13.3) in the Afinitor arm and 3.9 months (95% CI, 3.6-7.4) in the placebo arm. In the pivotal trial, the most common treatment-related, all-grade adverse events (AEs) (incidence >=20%) for Afinitor and placebo, respectively, were stomatitis (63% vs 19%), diarrhea (31% vs 16%), fatigue (31% vs 24%), infections (29% vs 4%), rash (27% vs 8%) and peripheral edema (26% vs 4%). The most common treatment-related grade 3/4 AEs (incidence >=5%) for Afinitor versus placebo were stomatitis (9.0% vs 0.0%), diarrhea (7.0% vs 2.0%) and infections (7.0% vs 0.0%). In February 2016, the US Food and Drug Administration approved Afinitor for the treatment of adult patients with progressive, well-differentiated nonfunctional NET of GI or lung origin that are unresectable, locally advanced or metastatic. In April 2016, the Committee for Medicinal Products for Human Use (CHMP) of the European Medicines Agency (EMA) adopted a positive opinion for Afinitor tablets for the treatment of unresectable or metastatic, well-differentiated (Grade 1 or Grade 2) nonfunctional NET of GI or lung origin in adults with progressive disease. Afinitor received approval for this indication in Canada in May 2016, and additional worldwide regulatory filings are underway. RADIANT-4 (RAD001 In Advanced Neuroendocrine Tumors) is a Phase III prospective, double-blind, randomized, parallel group, placebo-controlled, multicenter study. It examined the efficacy and safety of Afinitor plus best supportive care (BSC) vs placebo plus BSC in 302 patients with unresectable, progressive, well-differentiated nonfunctional, locally advanced or metastatic NET of GI (excluding pancreatic) or lung origin. The primary endpoint of RADIANT-4 was PFS based on independent radiological assessment evaluated by Response Evaluation Criteria in Solid Tumors. Secondary endpoints included overall survival and best overall response rate (defined as complete response plus partial response). Patients were randomized 2:1 to receive a daily dose of Afinitor 10 mg or placebo (supplied as tablets). During treatment, all patients received BSC, which excluded somatostatin analogues (SSAs). Patients had low or intermediate grade histology, no history or active symptoms of carcinoid syndrome, and documented disease progression within the previous 6 months, and were required to have stopped treatment with SSAs for 4 weeks before study entry,. The safety profile of Afinitor was consistent with what has been observed in previous studies of this drug. Afinitor (everolimus) tablets is approved in in more than 110 countries, including the US and in the European Union, for locally advanced, metastatic or unresectable progressive NET of pancreatic origin. Afinitor is not indicated for the treatment of patients with functional carcinoid tumors in the US. Afinitor is now also approved in the US and EU for the treatment of adult patients with progressive, well-differentiated (Grade 1 or Grade 2), nonfunctional neuroendocrine tumors of gastrointestinal or lung origin that are unresectable, locally advanced or metastatic. It is also approved in more than 120 countries including the US and European Union for advanced renal cell carcinoma following progression on or after vascular endothelial growth factor (VEGF)-targeted therapy (in the US, specifically following sunitinib and sorafenib). exemestane, after prior endocrine therapy. Afinitor/Votubia can cause serious side effects including lung or breathing problems, infections (including sepsis), and kidney failure, which can lead to death. Patients taking concomitant angiotensin-converting enzyme (ACE) inhibitors may be at an increased risk for angioedema. Mouth ulcers and mouth sores are common side effects. Afinitor/Votubia can affect blood cell counts, kidney and liver function, and blood sugar, cholesterol, and triglyceride levels. Afinitor/Votubia may cause fetal harm in pregnant women. Highly effective contraception is recommended for women of child-bearing potential while receiving Afinitor/Votubia and for up to eight weeks after ending treatment. Women taking Afinitor/Votubia should not breast feed. Fertility in women and men may be affected by treatment with Afinitor/Votubia. The foregoing release contains forward-looking statements that can be identified by words such as "dedicated," "positive opinion," "underway," "yet," "will," or similar terms, or by express or implied discussions regarding potential new marketing approvals for Afinitor (everolimus), potential new indications or labeling for Afinitor, or regarding potential future revenues from Afinitor. You should not place undue reliance on these statements. Such forward-looking statements are based on the current beliefs and expectations of management regarding future events, and are subject to significant known and unknown risks and uncertainties. Should one or more of these risks or uncertainties materialize, or should underlying assumptions prove incorrect, actual results may vary materially from those set forth in the forward-looking statements. There can be no guarantee that Afinitor will be submitted or approved for sale in any additional markets, or at any particular time. Neither can there be any guarantee that Afinitor will be submitted or approved for any additional indications or labeling in any market, or at any particular time. Nor can there be any guarantee that Afinitor will be commercially successful in the future. In particular, management's expectations regarding Afinitor could be affected by, among other things, the uncertainties inherent in research and development, including unexpected clinical trial results and additional analysis of existing clinical data; unexpected regulatory actions or delays or government regulation generally; the company's ability to obtain or maintain proprietary intellectual property protection; general economic and industry conditions; global trends toward health care cost containment, including ongoing pricing pressures; unexpected safety, quality or manufacturing issues, and other risks and factors referred to in Novartis AG's current Form 20-F on file with the US Securities and Exchange Commission. Novartis is providing the information in this press release as of this date and does not undertake any obligation to update any forward-looking statements contained in this press release as a result of new information, future events or otherwise. American Cancer Society. Gastrointestinal Carcinoid Tumors. Available at http://www.cancer.org/acs/groups/cid/documents/webcontent/003102-pdf.pdf. Accessed May 2016. American Cancer Society. Lung Carcinoid Tumors. Available at http://www.cancer.org/acs/groups/cid/documents/webcontent/003117-pdf.pdf. Accessed May 2016. Afinitor Summary of Product Characteristics. Yao J, et al. One hundred years after "Carcinoid:" Epidemiology of and prognostic factors for neuroendocrine tumors in 35,825 cases in the United States. J Clin Oncol. 2008; 26: 3063-72. Öberg K, et al. Gastrointestinal neuroendocrine tumors. Annals of Oncology. 2010; 21: vii72-vii80. Choti M.A., et al. Prevalence of functional tumors in neuroendocrine carcinoma: An analysis from the National Comprehensive Cancer Network Neuroendocrine Tumors database. The North American Neuroendocrine Tumor Society (NANETS) Symposium. October 2012, San Diego, US. Modlin I, et al. Priorities for improving the management of gastroenteropancreatic neuroendocrine tumors. J Natl Cancer Inst. 2008; 100: 1282-1289. Modlin I, et al. Current status of gastrointestinal carcinoids. Gastroenterology. 2005; 128: 1717-1751. Wolin EM. Challenges in the diagnosis and management of well-differentiated neuroendocrine tumors of the lung (typical and atypical carcinoid): Current status and future considerations. The Oncologist. 2015; 20:1123-1131. National Cancer Institute. "NCI Dictionary of Cancer Terms." Available at http://www.cancer.gov/publications/dictionaries/cancer-terms. Accessed May 2016. Yao J, et al. Everolimus for the treatment of advanced, non-functional neuroendocrine tumours of the lung or gastrointestinal tract (RADIANT-4): a randomised, placebo-controlled, phase 3 study. The Lancet. 2016; 387 (10022): 968-977.